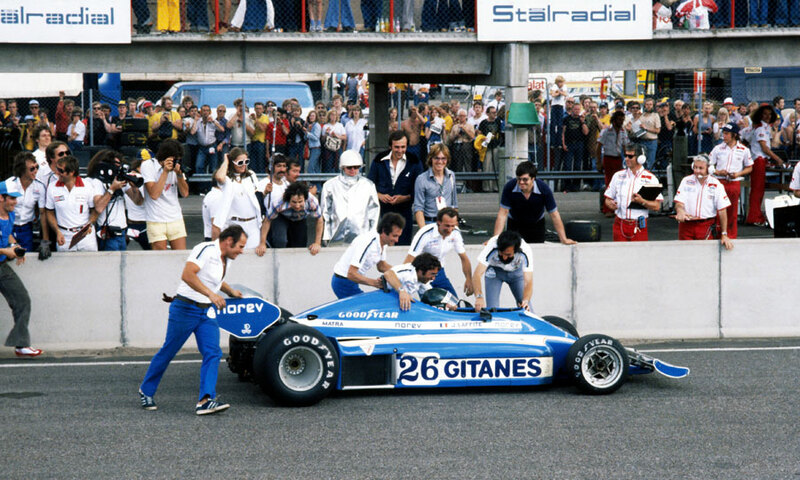 The wide-open 1977 season continued in Sweden where Jacques Laffite won for Ligier - the sixth different winner in the eighth race of the season - with Jochen Mass taking his best result for McLaren in second place. The preparations for the race weekend were dogged by rows over how many cars would be accepted for qualifying. In the event all 31 were allowed to take part with 24 gaining a place in the grand prix itself. One of those who made it through - going on to finish a creditable ninth - was Jackie Oliver, competing for Shadow in place of the absent Riccardo Patrese after a four-year absence. It was to be his final F1 outing. John Watson's Brabham led at the start with Mario Andretti (Lotus) second from Jody Scheckter's Wolf. Andretti took the lead on lap two and Watson remained behind him until lap 30 when Scheckter had a real go at grabbing the place and made contact with Watson's car, sending it spinning and from there into the pits, ending his hopes. James Hunt moved into second but his McLaren was suffering from understeer and a pit stop for fresh tyres put him out of the running. Laffite was on a mission and had quietly worked his way through the pack to take second place behind Andretti who at the three-quarter mark had a 15 second lead. But with three laps remaining Andretti's Lotus twice cut out and he had to make a dashed pit stop to take on enough fuel to get him to the finish. "Just one miserable gallon was all we needed," he lamented later. It cost him the win and relegated him to sixth as Laffite secured the first win for a French car/driver/team combination in the history of the World Championship. Lafitte crossed the line unaware he had won, explaining: "I knew Andretti was ahead but was unaware he had gone into the pits." Behind him came Mass and Reutemann with Patrick Depailler (Tyrrell) fourth with Watson fifth from Andretti. The Swedes were disappointed when Gunnar Nilsson retired with wheel-bearing failure and Ronnie Peterson's ignition failed on lap eight. Andretti's one point was still under threat as Ensign, for whom Clay Regazzoni had finished seventh, lodged a protest that the Lotus had been refuelled illegally and had rejoined the race under a red light. After deliberation, Lotus were fined 1000 Swedish Kronar and Andretti's finish stood.